Is Christmas Cosplay a thing? If it isn't, it should be, because it means we get this fabulous costume from Galacticat (who you might remember from her excellent DragonCon Brienne cosplay). Even the squirrels are in the holiday spirit! It truly is the season for fabulous Cosplay. 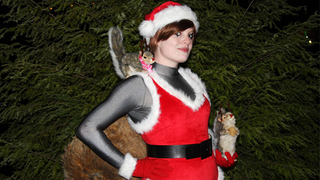 This gets me even more excited for Squirrel Girl's standalone series starting next month.